Throughout April 2018, Epiphone is offering fans a chance to win a new Epiphone Ltd. Ed. Matt Heafy "SnØfall" Les Paul Outfit! 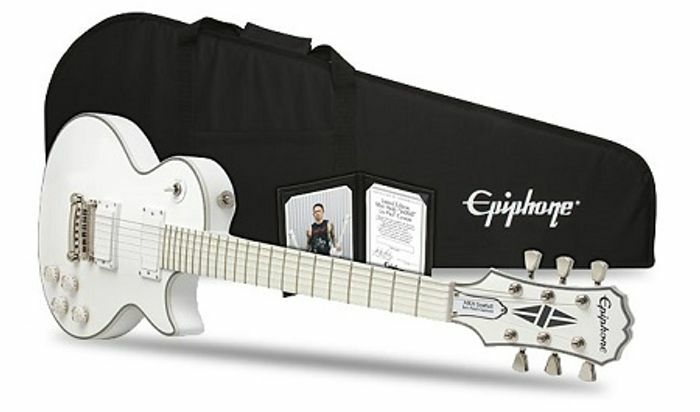 Designed in close collaboration with Matt Heafy, the Epiphone Ltd. Ed. Matt Heafy "SnØfall" Les Paul Outfit features an exclusive Alpine White Gloss Finish, EMG Active Pickups, a Premium Gigbag, and Certificate of Authenticity signed by Matt Heafy. The Epiphone April 2018 Giveaway Sweepstakes commences at 12:00:01 PM (CST) on April 1, 2018 and ends at 11:59:59 PM (CST) on April 30, 2018. All entries must be received by 11:59:59 (CST) on April 30, 2018. The contest is open to residents of the USA, Canada, and EU/UK. A winner from each of the three regions will be chosen May 1st 2018. Entries may only be submitted by a single Entrant. Group Entries will not be accepted. Only one (1) individual may be considered to have produced and submitted the Entry. Only one (1) e-mail account per Entrant will be eligible to win. Any Entrant found to use multiple accounts will be disqualified. Subsequent attempts made by the same individual to submit multiple entries by using multiple accounts or otherwise may be disqualified. Entries generated by a script, computer programs, macro, programmed, robotic or other automated means will be disqualified. If you are under the legal age of majority in your country of residence (a “Minor”), one of your parents or legal guardians must submit a signed, written statement that they have read, understood and agree to these Promotion rules with your entry, and that such agreement constitutes acceptance of these Promotion rules on behalf of you and themselves. The Winner will receive one Epiphone Ltd. Ed. Matt Heafy "SnØfall" Les Paul Custom Outfit (including gigbag).